ORONO, Maine --- The University of Maine women's ice hockey team lost to the University of Connecticut 1-0 in overtime at Alfond Arena Saturday afternoon. Maine falls to 10-19-3 on the season, while Connecticut improves to 11-17-8. Meghann Treacy (Lake Peakskill, New York) and Elaine Chuli combined to save all 19 shots on goal in the first period. Maine had the lone power play opportunity of the period, which was stonewalled by the Huskie netminder. The goaltenders were perfect again in the second period. Treacy and Chuli combined to save 24 shots on goal in the frame. Neither team had a power play opportunity. Once again, Treacy and Chuli kept the game scoreless by saving 16 shots on goal in the third. Each goalie produced amazing saves. Meghann Treacy saved a breakaway attempt from Sarah MacDonnell, and Elaine Chuli saved an Audra Richards (Maplewood, Minnesota) one-timer with her toe. The stalemate continued into the overtime period until Rebecca Fleming found the back of the Maine net at (10:31). Reese Maccario led a 3-on-2 break, along with Margaret Zimmer and Rebecca Fleming. Zimmer received a pass from Maccario and fired a shot on Treacy. The Black Bear goaltender made the save but left a rebound. Rebecca Fleming picked up the loose puck and ended the quarterfinal series. 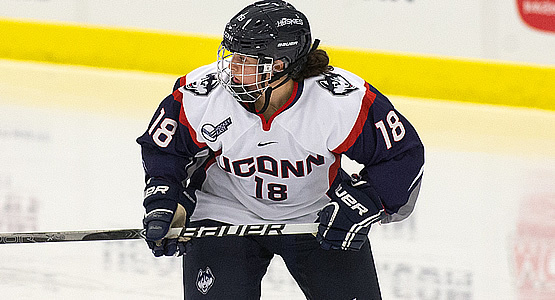 Katy Massey (Waterville, Maine) played in her 132nd game as a Black Bear, which broke the original record of 131 held by Myriam Croussette, Dawn Sullivan and Cheryl White. Massey now stands alone in first. Meghann Treacy saved26 of 27 shots on goal, and Elaine Chuli saved all 45 shots on goal. The Black Bears were 0-1 on the power play, while the Huskies scored zero goals in two power play opportunities. Maine ends season with 10-19-3 record and first ever home playoff series at the Alfond Arena.